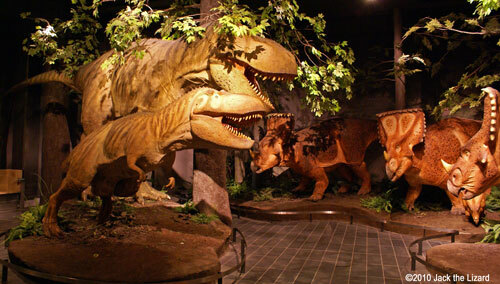 In Fossil Gallery you can see the variety of dinosaurs from carnivorous to herbivorous ones. Marine creatures from the ancient sea are also on display. 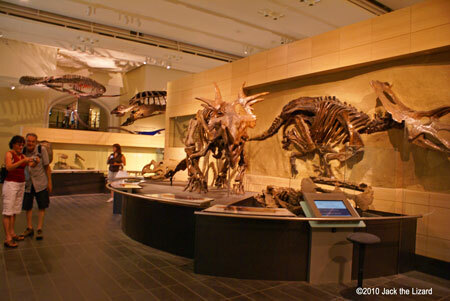 Most of the specimens are real and complete. Those are in fact very beautiful!! and other part of Canada. 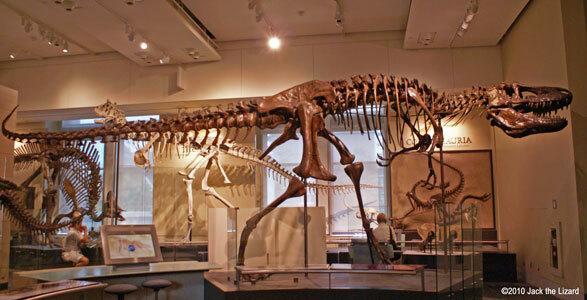 Daspletosaurus lived around 75 million years ago. 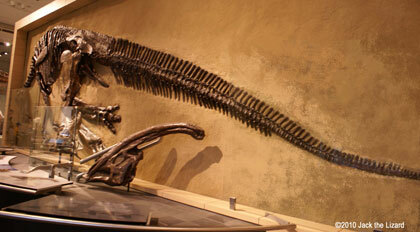 At that time Daspletosaurus probably was apex predator, so there were no other predator threatened Daspletosaurus. 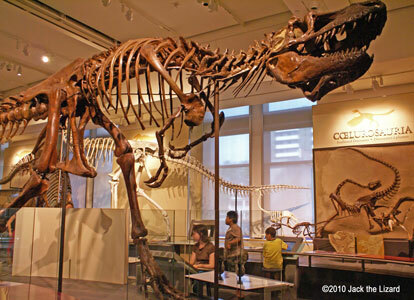 Tyrannosaurus appeared about 65 million years ago. Daspletosaurus is approximately 8m (26ft) in length, smaller than Tyrannosaurus, but they are closely related to each other. Anchiceratops lived during the late cretaceous period ( 73 to 70 million years ago ). 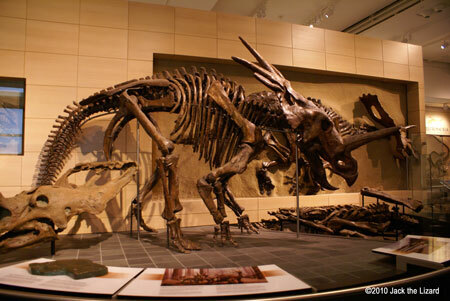 The first Anchiceratops was unearthed in Canada. This specimen is very rare because it is composed of almost complete skeletons. Characteristic feature of Anchiceratops is that there is relatively small hole inside of the frill. 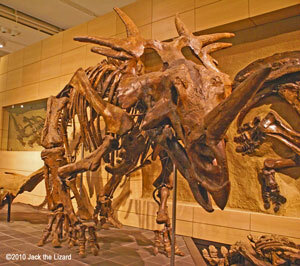 Styracosaurus lived around 73 million years ago. 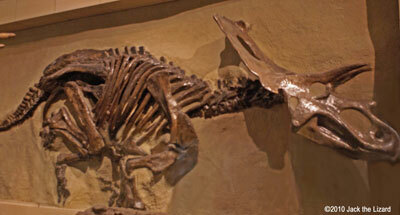 Leptoceratops lived around 68 to 66 million years ago. They belong to primitive group of ceratopsian dinosaurs, because they do not have broad frill and large horns as their cousins such as Triceratops do. Yet Leptoceratops coexisted with Triceratops same period of time. This is the evidence that successors do not always appeared after predecessors died off. 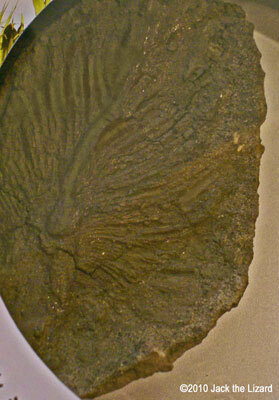 This is fossilized palm leaf impression. 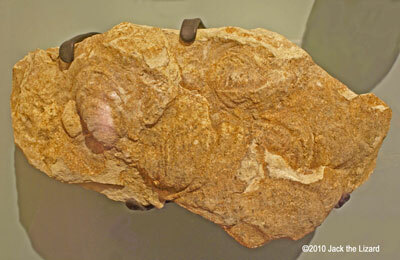 Triceratops was also excavated with this partial leaf in Morgan Creek, Saskatchewan. It is possible that Triceratops may have browsed on palm leaves. 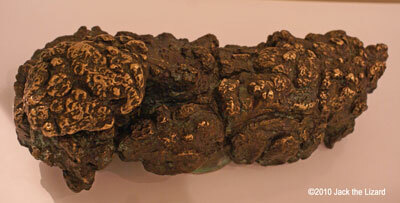 Coprolites are fossilized animal pooh. 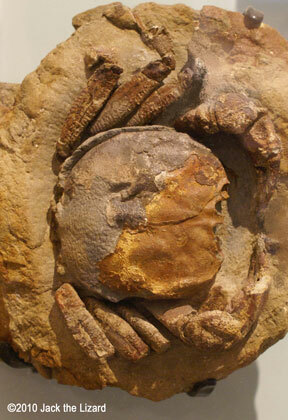 Since remains of Tyrannosaurus was found nearby, this dung probably from that dinosaur. For further indication the bones of hadrosaurus were in it. 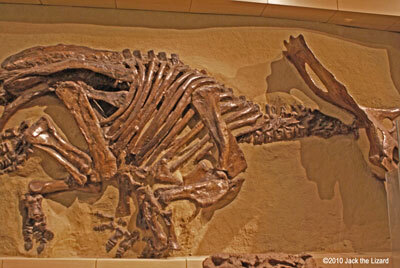 Edmontosaurus lived around 68 to 65 million years ago. 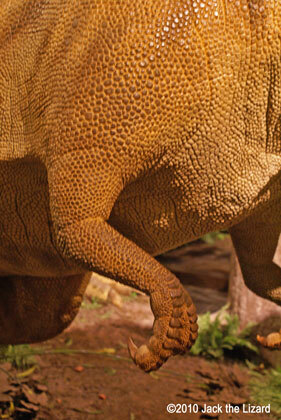 This hadrosaurine duck-billed dinosaur was plant eater. The specimen is found in Drumheller, Alberta. 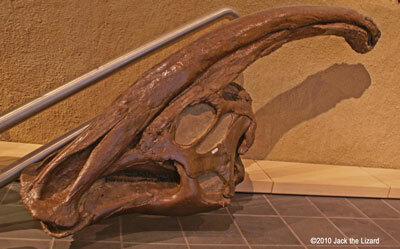 The crest of Parasaurolophus may have made loud sound to communicate with other members of herds. Platecarpus lived around 88 to 85 million years ago. 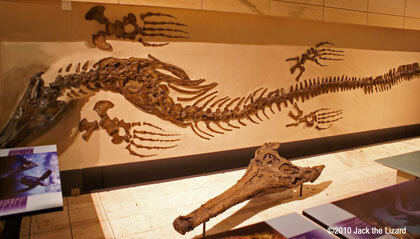 They are aquatic lizards belonging to the family of mosasaurus. 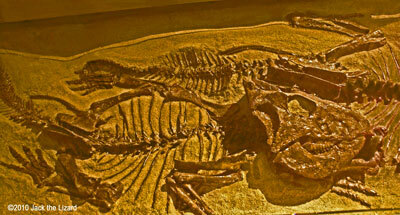 The fossils were found in Logan County, Kansas,U.S.A. These bony fishes lived during the cretaceous period, discovered in Gove County, U.S.A. 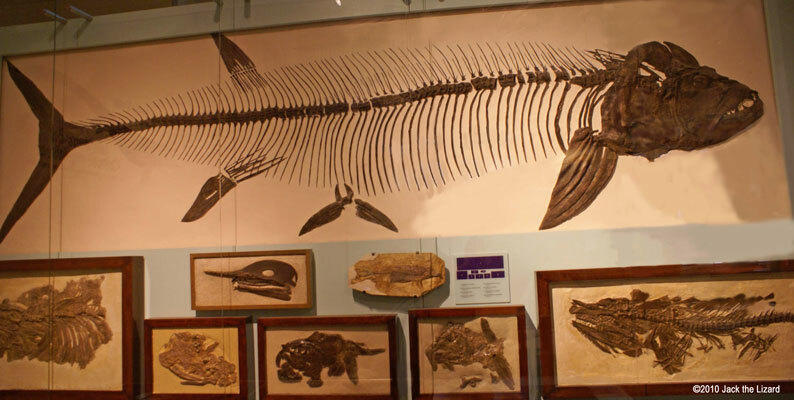 The largest fish is Xiphactinus. Cimolichthys is extinct predatory fish. 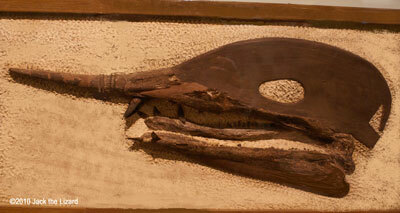 This swordfish fish lived during the late Cretaceous period. Inoceramus is clam from the Cretaceous period. You can touch these dinosaur models. The surface of the skin is carefully recreated.